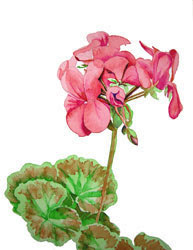 Watercolor Works: Finished Painting - Geranium in Watercolor! To view more of my flower paintings (and other pieces in a variety of topics) visit my website: http://watercolorworksart.com/gallery1.htm. I'll have to get busy this week and start another painting and I will take photos along the way to show you, once again, how I build a painting. My classes are set up such that I bring in a drawing and photo reference, and paint with my students. I demonstrate every step of the process so each student can learn how to develop a watercolor painting, and begin to have their own style, once they learn the process. We have lots of fun. Hope you can join us. I also have workshops about once a month. You can register online!